Ben Affleck's new suit and car. My initial impression is that I do like the new suit. I'm not a big fan of shorter ears on the Cowl but it never used to bother me with Adam West's cowl so it's not a real issue for me. I've heard a lot of comparisons of Ben's suit to the Frank Miller, Dark Knight Returns Batman and also the Jim Lee Batman and I certainly can see the similarities. It's also not unlike the suit used in the Batman Arkham Asylum video games - which is what I was kind of hoping for in terms of a suit redesign for the big screen movies. From Left: Frank Miller Batman, Jim Lee Batman, Arkham Asylum Batman. Director, Kevin Smith, who got an early sneak peak at the suit - in color - says it's an exact match to the suit Batman wears in Book 3 of Frank Miller's Dark Knight Returns. Which he says is why he hugged Zack Snyder upon seeing it (Kevin has repeatedly said in podcasts that The Dark Knight Returns is almost like his bible on the Batman mythos). along the lines of Captain America's S.H.I.E.L.D. 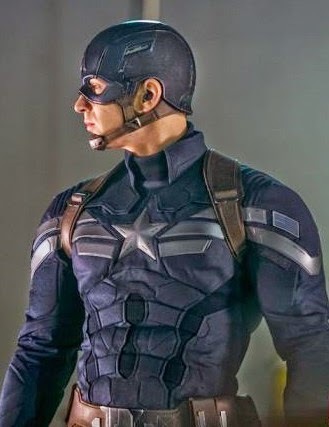 suit in Winter Soldier. From my point of view that's a good thing. Sure Batman needs a suit that provides some protection but why people think he needs to be bullet proof is beyond me? He's the kind of crime fighter that generally avoids being shot at with stealth moves... and seriously, all live action Batman suits to date offer limited protection against a head shot. Basically you can kill Batman the same way you kill a zombie - if he lets you get a shot in! 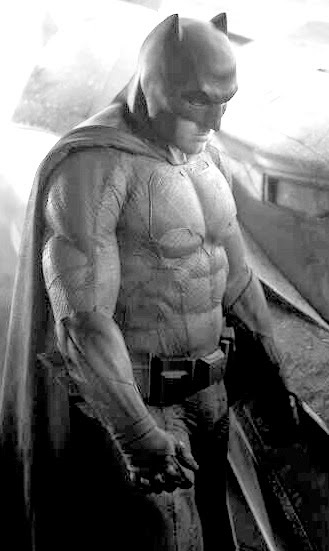 To me the Bat suit is more about aesthetics. Sure it needs to be practical and functional but the point of the look is to be intimidating and scary first and foremost. If it was totally about function Batman would be dressing more like a US Marine and his name would be redundant because he just wouldn't look like a Bat. One thing that would be nice to see is Batman getting a nice CGI cape like Superman's since, how Batman's cape moves is a big part of how he is drawn in the comic books. Last year rumor had it the Batmobile would be modeled on an 'old Cadillac' and that the car was being built by the same team who designed and built the vehicles for Transformers 4. 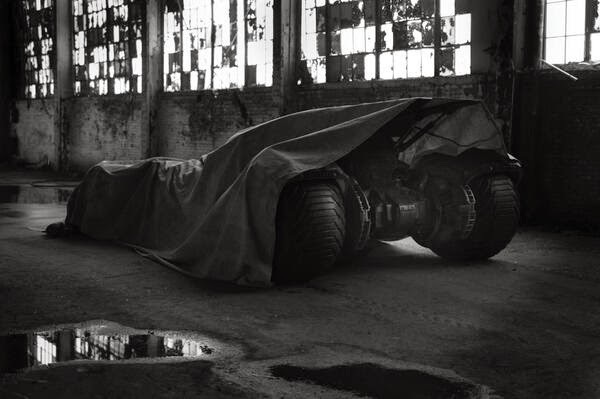 The day before Zack Snyder released the image of Ben in the suit next to the Batmobile he released this image of the Batmobile under a tarp. Rear view of the new Batmobile. 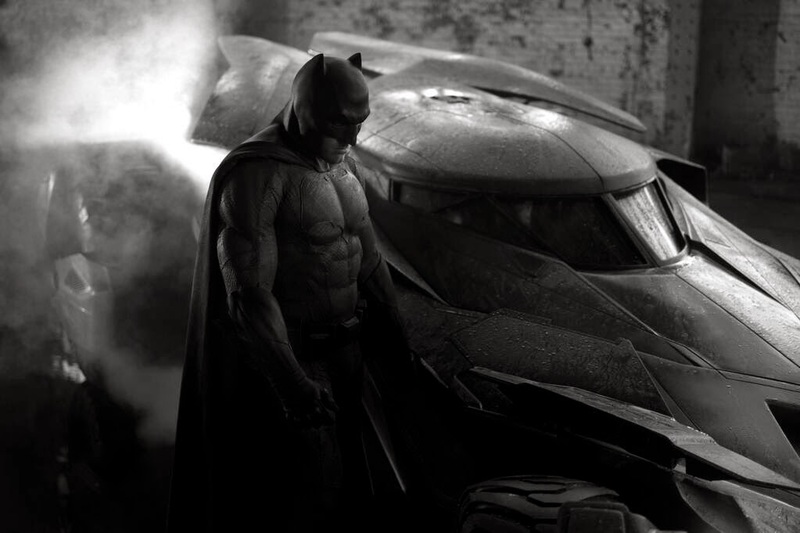 Hardly looks like a Cadillac of any sort does it when you team it with the Bat suit image? Kevin Smith hinted on a recent podcast that maybe Batman would have more than one car (and suit) in the upcoming film so maybe the 'old Cadillac' version is still a possibility? I'd heard there was some concept art floating around the internet of the new Batmobile but have yet to uncover or locate it. What I did find was a couple of unofficial images that give more clues as to what the vehicle under the tarp looks like. Unofficial photos of the new Batmobile. 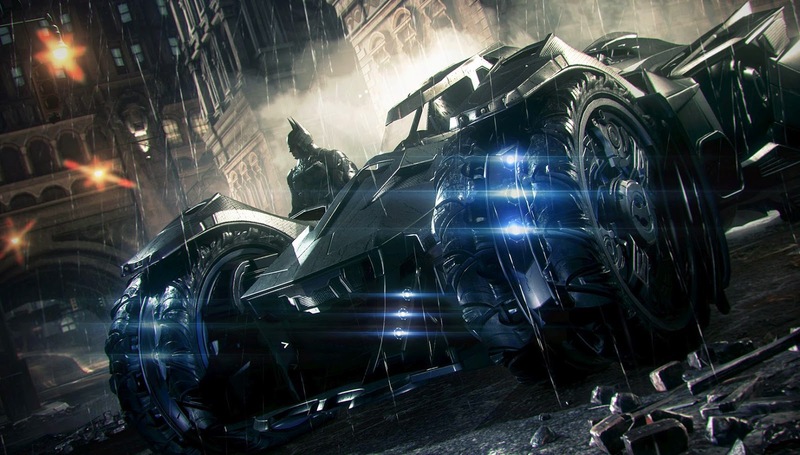 Comparing these images to the official image with Batman standing next to the car it looks like the canopy slides forward - and is open in that picture. You can tell this as in the Batman picture you can see the front wheel with a similar tread pattern to the vehicle in the unofficial photo above. The canopy is very close to the front wheel but in the unofficial images it's set more towards the rear. In the official photo with Batman it also looks like the car may have gull wing like doors - so Batman can simply step out rather than climb out perhaps? I've heard speculation that maybe this Batmobile is dual purpose, with all those air intakes it may double as the Batplane? Despite the some what aerodynamic looks of the front, that rear end shot makes it look too much of a tank to fly - and there's no obvious jet thruster/engine either - but you never know. 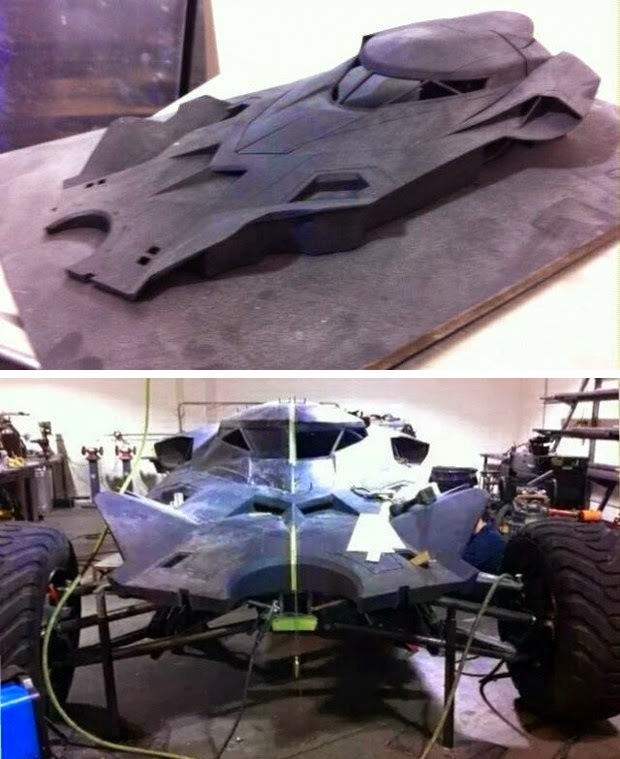 To me it looks like a cross between the Tumbler of Nolan's films and the Batmobile that appears in the Arkham Knights video game. There's elements from both with a bit of the old 1990's Batmobiles thrown in too. Although I like most of the Batmobiles we've had on film, even the slightly more outlandish Joel Schumacher versions, I'm not a big fan of Batman having such big or tank like cars. The 1966, Adam West, Batmobile has always seemed the most practical for a city based crime fighter who generally doesn't go up against armies. It's quick, reasonably compact, has a few useful gadgets and looks damn cool. Whilst I wouldn't suggest the '66 Batmobile would work in a modern Batman movie my preference is for something modern that looks more at home on tarmac, is streamlined and easily maneuverable in a city environment. More Lamborghini than Hummer. I like what we've seen of the new Batmobile but if there's a second vehicle to come - fingers crossed for the 'old Cadillac' version. Batman v Superman - Dawn of Justice is the new movie title. Below is the official logo that is not dissimilar to the one released when the movie was first announced. I'm pretty happy with the title. Some people say it's cheesy or too 'comic booky' but I tend to agree with others that it serves the purpose of the film, and basically confirms what I've said, that this film is a Justice League origin story. That said, I have to say this... oh crap! Yet another origin story! @**!!!! swear words! Look I'm not against origin stories as such. Batman Begins, Man of Steel, Iron Man, Captain America, X-men First Class, Wolverine, Fantastic Four, Green Lantern and both Spiderman and its reboot are all good origin films to varying degrees. I'm just sayin' - there's quite a lot of them in the comic book movie genre. Batman '89 did one thing that future films should take note of. Although it was an origin film, Batman was already fully realized at the start of the film. You got to learn his history in short flash backs. The origin wasn't the focus of film. If anything it was a Joker origin story. But I digress. My point is I'd like to see more superhero movies that have a starting point of the superhero fully realized right out of the gate. Hopefully that's what we might get when the officially announced Justice League movie comes out. Established heroes going up against some new threat or challenge. For me that's one of the highlights of Ben's Batman. Finally we get to see what an established Batman, with years of experience behind him, might look like. Crossing my fingers there's no scene with him crying into a beer with Superman sharing 'dead parent' stories. Anyhow... back to the title and logo. Thumbs up from me. Title is fine. Subtitle makes it sound a bit like a Transformers movie but otherwise, I'm happy. The logo is pretty much the same as what we've gotten used to since Batman was first announced as being in the Man of Steel sequel. I really don't care that Batman has first billing in the title. If Batman can help cement Superman's place as arguably the world's most recognized Superhero then let him help. The important thing is that this movie does really well, followed strongly with the Justice league film. After that DC Entertainment and Warner Brothers will hopefully be on firmer ground with comic book movies and perhaps we'll see those Batman and Superman solo films along with Wonder Woman and maybe a better Green Lantern film too. In the meantime, if you want a kind of preview of what a grey and black Bat suit looks like in a live action film I stumbled across this half hour fan made short that portrays a pretty good Batman. Christian Bale's Batman might have been almost perfect if he'd done the voice more along this actor's take. It's not brilliant or a perfect take on Batman's world but for a fan made film it's outstanding.